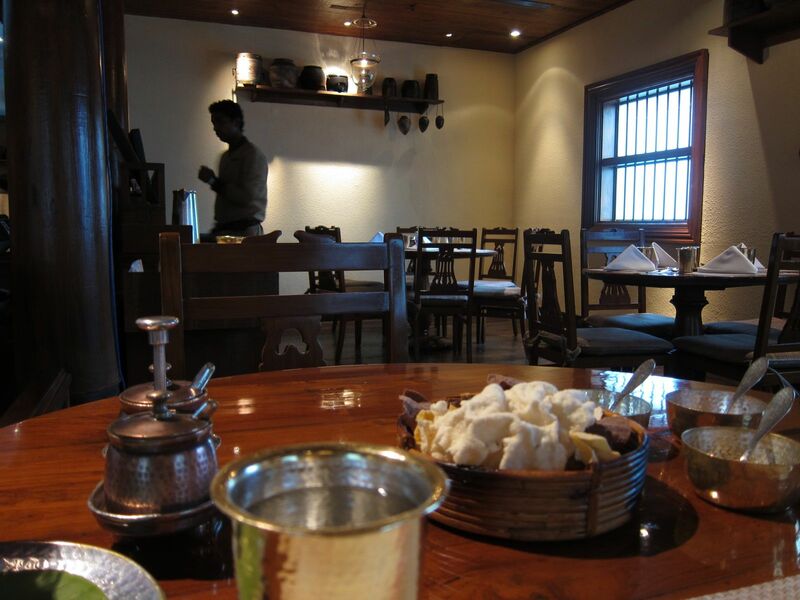 Konkan Cafe delightfully recreates the ambiance of a Konkan home, with its warm wooden interiors, period furniture, pots and pans hanging on walls and traditional banana leaf covered thalis. But what has been attracting lovers of coastal cuisine is clearly their food. 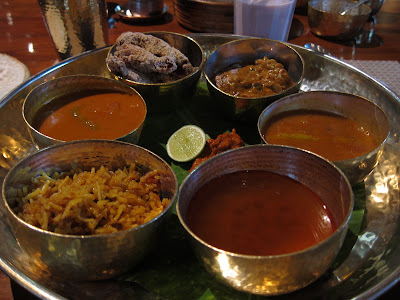 I decided to go with the Thali along with a glass of Solkadi. Solkadi is a cooler commonly served in the coastal areas of Goa and the Konkan. Made from the Kokum fruit and coconut milk, this drink has a uniquely soothing flavor. However, not everyone makes a great solkadi. The drink here was among the best I have had, its pink hue attesting to freshness of the kokum used. 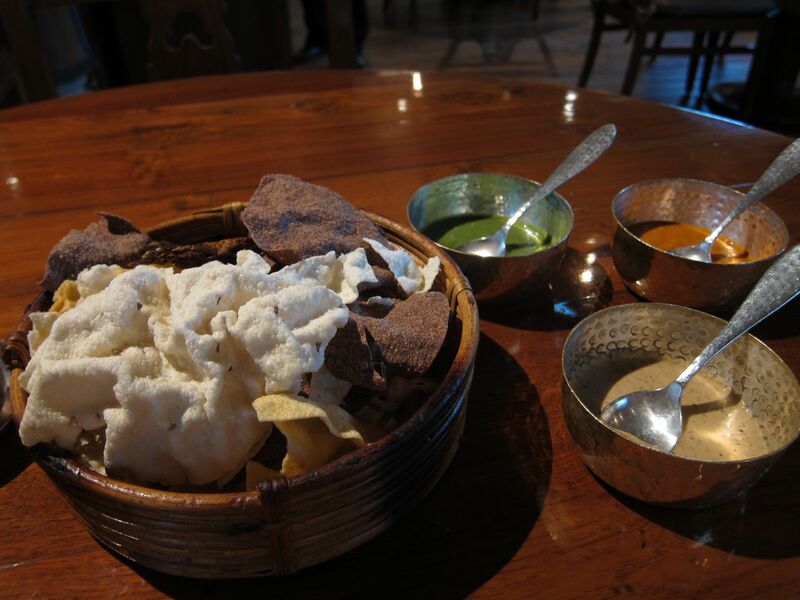 They put a variety of papads in front of me to nibble upon as I awaited my thali, which appeared fairly quickly. There were bowls of sambhar, rasam, fish fry, fish curry in red sauce, traditional chicken curry and masala bhaat. 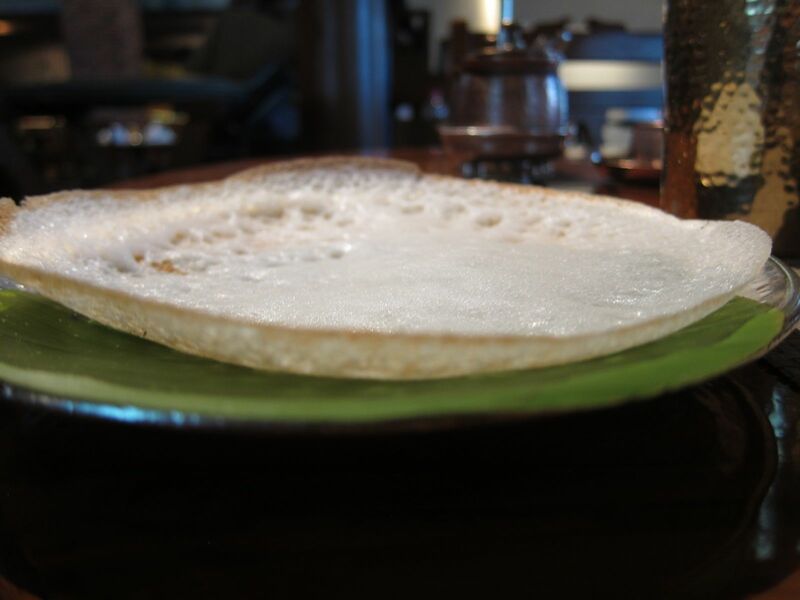 They served a freshly made, fluffy appam and followed up later with a neer dosa and malabar parotha. The fish fry was completely delectable - the crunchy suji of its coating contrasting with the succulent flaky fish inside. Ravas is a variety of Indian salmon, very popular in this region. The fish curry was cooked in red onion and tomato and pretty good. The chicken curry was made with whole pods of garlic, lots of onion and curry leaves. 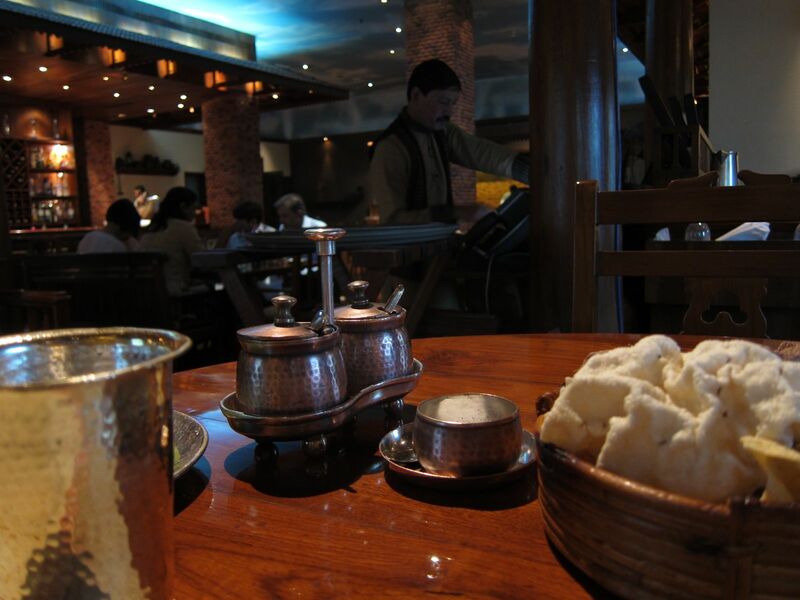 Both dishes benefited from the attention paid to the quality of its spices. Konkan Cafe still claims to stone -grind their spices, the way I remember them done at my home during my childhood days. 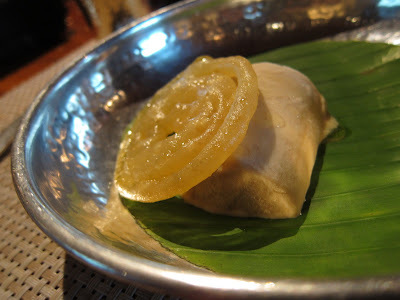 I ended with a dessert combo of Kulfi with freshly made Jalebi. I was very full at this point, and yet very tempted to order another helping. Another day maybe! If you wish to select from the a la carte menu, try the Thechyacha Zinga, prawns tossed in pounded green chillies and garlic; Kelfulache Vade, crispy fried seasoned banana flower; Meen Pollichattu, a banana leaf wrapped roasted fish dish from Kerala, or Sukka Mutton, a dry mutton dish to die for. Hi Shantanu, This is saheli on behalf of Copper Chimney. Could you please share your email ID so I can send you an invitation to review the newly launched Copper Chimney in Koregaon park? Thanks. 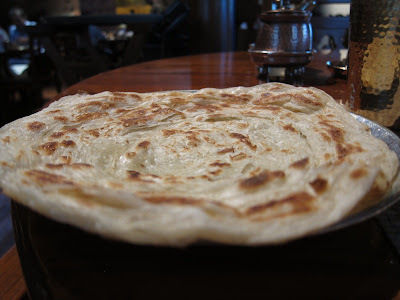 @Raving Mad: I have already reviewed Copper Chimney in KP a few posts back. Ah! Their jalebi's are simply awesome! They made fresh ones when we requested. @Rahul: Yes, makes all the difference. 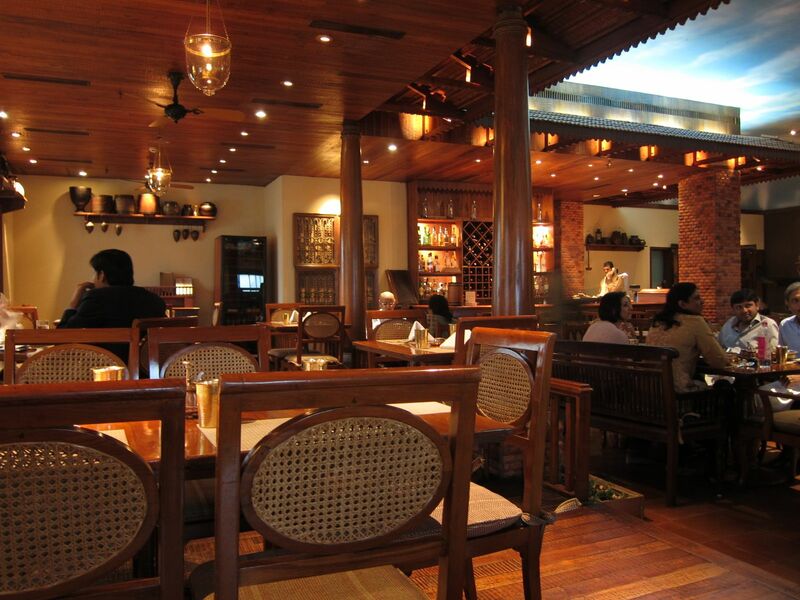 On behalf of Vivanta by Taj, it’s a pleasure to be introduced to you. We have followed your blog posts and have found them interesting. As a part of brand Vivanta’s endeavor to engage with like-minded online blogging communities and opinion leaders, we would like to extend you an invitation for an exclusive event presented by Vivanta by Taj in association with Diageo. The FUSE 2.0 series of Vivanta signature cocktails have come about through an exclusive partnership with Diageo India. These cocktails rustled up by master mixologist and Reserve Brand Ambassador for Diageo India, Mr. Tim Etehrington Judge, have been crafted keeping in mind the style and spirit idiom of Vivanta by Taj and as a tribute to key cities where Vivanta has an address. This select series of cocktails is being unveiled at a special interactive preview for key media at the Vivanta by Taj – President, Mumbai on the 05th September. Before we can proceed, we would like to know your availability on 5th September to attend this prestigious event at Vivanta by Taj President, Mumbai. Please do send across your mobile number and we can take this forward. @nishant: Thank you for the email. Unfortunately, I didn't see it in time. Also, may not have been able to make it to Mumbai on that day. I have visited this place 2-3 times. Earlier at the same place "Gulzar" was there which was closed to make way to Kokan Cafe.